In 2011, Senator Bill Frist offered me the once-in-a lifetime opportunity to lead Tennessee’s State Collaborative on Reforming Education (SCORE). Education was my passion during my time as a State Senator, Chairman of the Senate Education Committee, and Senate Speaker Pro Tempore. While I was proud of our bipartisan, student-centered policies to transform public education in Tennessee, Senator Frist persuaded me the time was right to enter a new type of service that would advance student success in our great state even further by ensuring public policies were implemented with fidelity, that innovation always was driving us forward, and that more partners were engaged in the work of improving student achievement. These past eight years at SCORE working beside you have been such a pleasure and so rewarding because we created lasting, positive impact for students, families, educators, and communities across our state. Tennessee became the fastest-improving state in the nation in student achievement and reached the top half of the nation in science and fourth-grade math on the National Assessment of Educational Progress. Opportunities expanded for teachers to grow as teacher-leaders, and multi-measure feedback and evaluation evolved into a process that helped improve instruction. Top-performing schools and districts were celebrated and their innovations elevated with the SCORE Prize. Public charter schools and turnaround schools brought unprecedented growth to students who too often have been overlooked and underserved. These accomplishments by our hard-working teachers, school and district leaders, students, and advocates are deeply satisfying for all of us. SCORE, barely two years old at the time I joined as CEO, has matured into a strong, thriving, and nimble organization. We are, as an organization and a state, well-positioned to accelerate student growth and success in new and innovative ways. Now the time is right for a new leader to step in to build on our achievements and continue the momentum and impact as SCORE enters its second decade. I am thrilled that Senator Frist and our board have unanimously selected David Mansouri to lead SCORE into the future as Chief Executive Officer. David is a dynamic, collaborative, and student-centered leader. He has been my right hand and a vital part of all that SCORE has accomplished over the past eight years. I will support him enthusiastically from my new role as senior adviser to SCORE as he pushes ahead this work that is so essential for students. It has been my true privilege to facilitate – and celebrate – the excellence, optimism, courage, and innovation that SCORE pursues. Importantly, just as Senator Frist envisioned when he founded SCORE, collaboration is the hallmark of how we do our work. Over the past eight years, SCORE and our partners have done something that is currently far too rare in our nation. Year after year, we have reached across political and ideological divides – working with parents and policymakers, educators and elected officials, community and philanthropic leaders – to find and advance the very best student-centered solutions to dramatically improve student achievement in our great state. We have leaned into this challenge with the belief that the right way is the Tennessee way: set high expectations, measure progress, and hold schools, districts, and ourselves accountable for giving every student an excellent education. While SCORE’s impact on schools and students has grown, so has our team of mission-driven professionals. 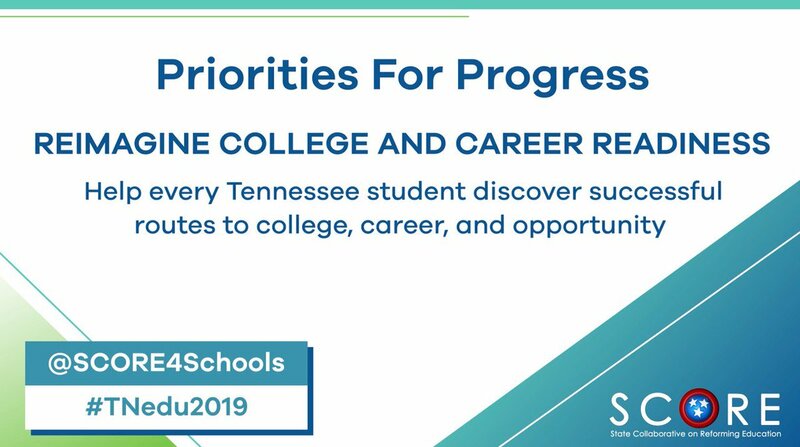 Since 2011, SCORE has quadrupled the investment in our mission and dramatically increased our initiatives and projects as we worked with generous donors who shared our vision that Tennessee could become a national leader in improving student outcomes. I am especially proud of the people of SCORE who have accomplished so much – our dedicated educator engagement team, robust policy and research team, and best-in-class finance and operations, strategic communications, advocacy, and government relations teams. We have established a school superintendent learning network to innovate, incubate, and share best practices and a growing educator fellowship program to elevate the voice and expand the advocacy of student-focused teacher-leaders at the local, state, and federal levels. While I cannot list all the accomplishments of the past eight years, recalling them has filled me with awe and gratitude for what we have done together. There is, of course, still much more work to be done, and I am confident that the SCORE Board, executive leadership, Steering Committee, and team – working together with student-centered educators and our many partners – will not stop until all Tennessee students are prepared for a successful future. I will continue to support you and your work, actively advising and assisting where needed. I’m also excited to begin my responsibilities as a new member of the University of Tennessee Board of Trustees. And I’ll continue to serve as the national co-chair of the Knight Commission on Trust, Media and Democracy to help find real solutions in restoring greater civility in our public discourse and public confidence in the institutions so important to our democracy. It is with deep appreciation and gratitude that I thank you for your support, your encouragement, your counsel, and your never-ending belief that Tennessee students can be the best in the nation. Our students and our state need you, and I cannot wait to see what you accomplish next. Jamie Woodson is the executive chairman and CEO of SCORE.